“Perspectivity had the opportunity of facilitating the Stress Nexus! Challenge at Interpore 2018 in New Orleans, USA. Interpore is the annual global conference for Porous Media research and draws over 600 PhD / Post-doctoral research students and faculty members from leading universities across the globe and industry insiders. The Stress Nexus! session this year followed the resounding success of the Energy Transition Challenge at Interpore 2017 in Rotterdam. We had 21 participants across three tables, each table facilitated by newly trained game leaders from the student organizing committee of Interpore. I was the overall and the only game leader from Perspectivity. I conducted a train-the-trainer session in the afternoon of May 15th, 2018 and led the main session later in the evening. It was a very efficient way to reduce travel across continents for additional game leaders and at the same time bring new game leaders into our community. 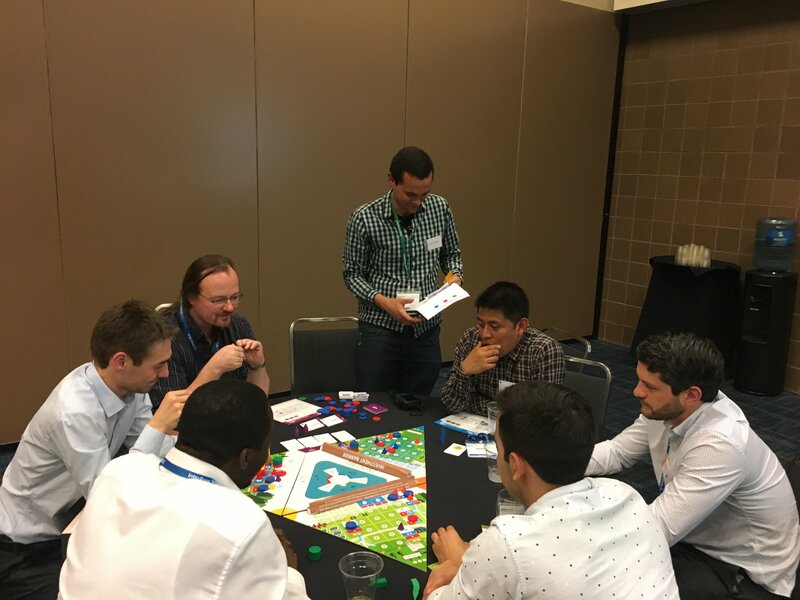 As a game leader, the best part is that no matter how many times you have facilitated such sessions, there is always something new and different that you experience at the table. The game and the prospect of winning excite everyone but, as the game unfolds, emotions quite often take over logic and strategy. Alliances get formed not always to do best for everyone but to block someone from “winning”. And while you might think that you have the utopian solution that benefits everyone, one still needs to ensure that everyone sees the benefits in the same light and is aligned. Building trust and retaining it is always the tricky part at such sessions when players are meeting each other for the first time. We had an excellent time playing the Stress Nexus challenge in New Orleans. It was quite a challenge indeed, to be immersed in the complex interactions between governments and companies in the much-needed fight for resources, survival and economic growth. It was particularly interesting to see how the flexibility of the game itself allowed for the participants’ own personalities to surface and ultimately lead the development of their teams. Although the goals were the same for everyone, each person played differently because each person is different and that led to a very interesting group dynamic. In short: The Stress Nexus challenge provided us with an outstanding platform for making new friends while learning the very realistic complex dynamics of the fight for survival and economic growth. I thoroughly enjoyed it and would love to play it again! The Stress Nexus! challenge was surprisingly subtle in the ways that interaction between players, or sometimes the lack of it, would impact the outcome of the game. I think a very important aspect of the game is the time limitation of each trade round. It makes it clear that yes, you might have the necessary amount of resources for all countries and companies to thrive. But if you need to haggle or make special deals every round you will not have time to distribute it. A way to fix this is to make policies for how the water should be distributed, which is obviously not easy during a three-minute water conference (?). I hope I will get to play the game, or be a game leader next year in Valencia! First of all, I have to say it was a really nice and refreshing experience from me. I really loved how the game was designed in terms of rules and unknown game length. Due to this a certain dynamic evolved in the game and it was fascinating to watch the players play. You could see that every person had a different type of playstyle, for example “I want to get all the water first so I can distribute it fairly” or on the other hand “I will spend my money with the sole purpose to help all the other players”. But then in the debriefing people started to understand the deeper meaning of the game and that if they would have played differently (in terms of teamplay), they would have had even more money. And I think this is the wonderful message of this game, to see that we are one community and not one company or country on this world and that we have to play together to make the best out of it. 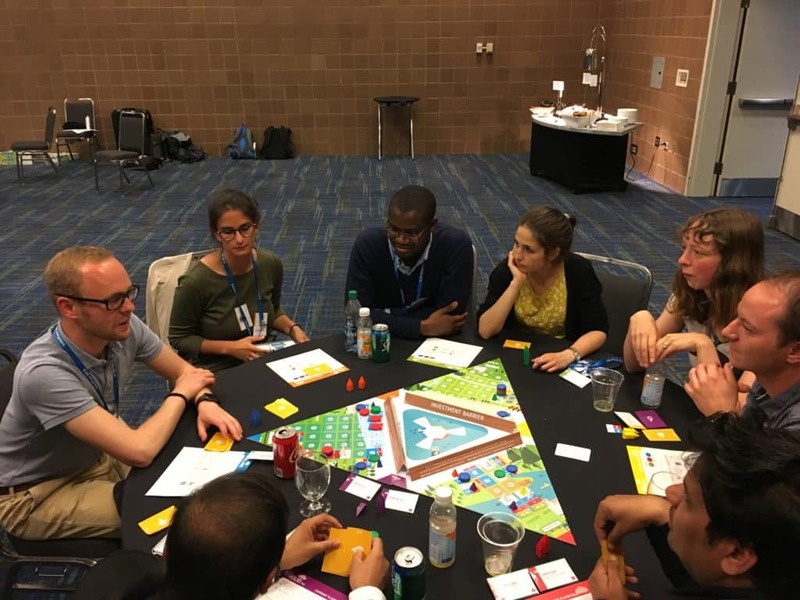 The game furthermore is also a great opportunity to get to know new people which is always a big benefit at conferences. I hope that I can act as a game leader again in the future!